A cleaner and more efficient solution for the wood heating consumer and the wood heating industry is now available in Australia. 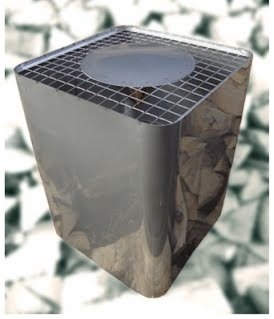 With consumers having reported difficulty with new certified wood heaters in lighting up, having smoke pour into the house when loading or lighing, take longer to get to their optimum heating capacity and chunder out smoke into the atmosphere, the answer is the FlueCube. The FlueCube works on both new and old model wood combustion heaters. The FlueCube replaces your existing flue cowl allowing your wood heater to operate more efficiently. Inventor and electrical engineer Neville D’Herville; from his experience in developing central heating systems in the 70’s, has developed a simple and effective fix to an age old problem affecting wood fuelled home heating appliances. He has developed a flue cowl that is effective in removing atmospheric back pressure caused in typical winter conditions. The genius in the FlueCube is in its ability to integrate the colder air into the way it functions. It is cubic in design and this is important. As hot air rises up the flue, cold air from above is drawn in through the four corners and into the cowl’s chamber. The hot air from below, due to the design is forced to fan outward and mixes with the cold. The two air currents form into a spinning cyclone within the chamber. 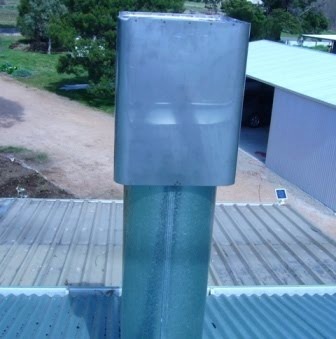 This stops the cold air affecting the flue outlet, the flue is then able to absorb enough heat throughout its length and allow any smoke and particulates to travel up and out without any obstruction. The result is a fire that lights quicker, heats faster, uses less wood, and doesn’t pollute the inside of your home with smoke and odours.